Here at iDt Group, we have a cloud based time and attendance solution (Biotime) and we even have biometric clocks that have been built specifically to work with Biotime. One of the things I like about cloud based solutions is that they are constantly being updated. Bugs are being sorted, new functionality is added and the user interface typically becomes more and more appealing. With on-premise software, you typically have to wait for a yearly upgrade along with the expense of installing and configuring the upgrade. One of the other main advantages of the current round of updates is speed. There has been significant improvement in the performance of Biotime. I have recently seen some of the changes that will be rolled into Biotime in the next few days. 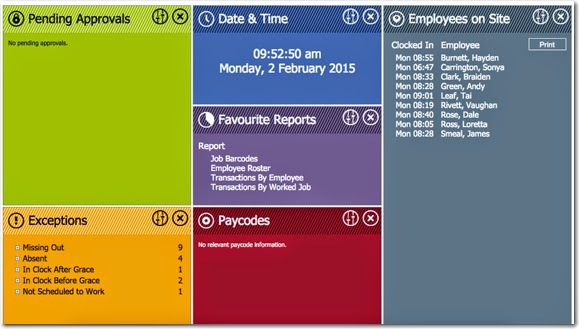 The new style of customisable widgets is pretty cool, allowing the user to customise a dashboard to their liking. There are also a host of there features that are currently under wraps.